Celtic Music Journal and 67 Music take over the Irish & Celtic Music Podcast with music from their video journal. Enjoy great Celtic music from Poitin, Na Rosai, Ciana, The Fire Inside, Celtica Pipes Rock, Andrea Tophoj and Rune Barslund, Peter Daldry, The Gothard Sisters, Crossbow, Old Man Flanagan’s Ghost, Marc Gunn, The Fire, Beltaine, Journey North, Sons Of Malarkey, West Of Mabou. 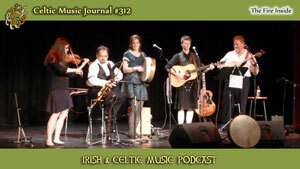 What I’m decided to share with you in this particular show is some of the music from the artists that have appeared on our show, The Celtic Music Journal. I call it “The Celtic Music Journal Spotlight”. While the show is a visual medium, I thought it’d be fun to spotlight the music for you. There’s a lot of variety and I’m sure you’ll enjoy it. The man himself Marc Gunn has been on our show too & you’ll hear him here! Listen and enjoy, then you can then watch all the artists you hear in this show! Just click to our website and we’re also on YouTube, our channel is at www.youtube.com/user/sixtysevenmusic. Log in,watch and subscribe! The Celtic Music Journal is produced by 67 Music. We began the show in August 2014. Since then we’ve produced 7 editions with more on the way. The premise is simple yet unique: we invite bands, musicians and other artists to send us their video ‘journals’, to tell their story & show the world what they offer and what they do. We then gather 3-5 journals per show and put them together to share with you. It’s an exciting way to discover up and coming talent and revisit established artists. We’ve featured artists from all over the world. You should consider being on it, too! Just click to our website for details and watch all the shows. As always, I want to send out a HUGE thanks to the patrons of the podcast. Your generous pledge of as little as $1 per episode pays for the production of this podcast as well as my time in producing the show. You will enjoy a personal podcast feed where you can listen to the show before regular subscribers, occasional extended editions of the show, and my deepest thanks. When we hit a milestone, you get a 2-hour special. Thanks to our newest patrons: John OConnor, Keriann Noble, Mary Botkin, Samuel G, Donald McLeod, and a extra special thanks to our newest Celtic Superstar, Nancie. Thank you all for your generosity! Become a patron today! 41:23 WHAT IS 67 MUSIC?